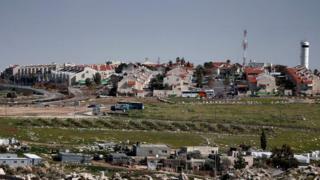 Israel has advanced plans to build more than 1,000 new homes in Jewish settlements in the occupied West Bank. Final approval for construction was given for 382 homes, while the others cleared an earlier planning stage. Anti-settlement watchdog Peace Now said most would be built in communities that were likely to be evacuated as part of any peace deal with the Palestinians. Peace Now reported that 370 of the homes given initial approval would be built in the settlement of Adam, where an Israeli civilian was stabbed to death and two others wounded by a Palestinian last month. Israeli Defence Minister Avigdor Lieberman had promised to build 400 units there in response to the attack. The main body representing Jewish settlers - the Yesha Council - expressed disappointment that plans for "so few" homes were approved on Wednesday. But a left-wing Israeli party, Meretz, warned that the decision was like "sticking a finger in the eye" of any possible peace process. There was no immediate response from the Palestinian Authority to the announcement, but it has previously said settlement construction threatens peace and undermines the two-state solution to the Israeli-Palestinian conflict. The US state department did not criticise the Israeli move. "The president has made his position on the settlements clear, and we encourage all parties to continue to work towards peace," it said. Donald Trump said earlier this year that the settlements "complicate" the peace process and urged Israel to be "careful" over the issue. His predecessor Barack Obama said they were incompatible with a two-state solution and did not veto a 2016 UN Security Council resolution declaring they had "no legal validity and constitute[d] a flagrant violation under international law".